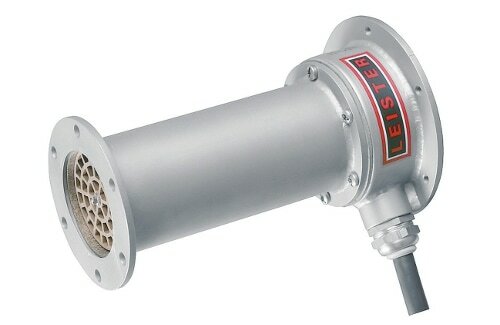 Leister LE TOOL Double-Flange Air Heater - Manufacturing - STANMECH Technologies Inc. These Double-Flange (DF) air heaters are suitable for integration into machinery. With the Double-Flange Recirculating model (DF-R), air inlet temperatures can be as high as 350°C; preheated air can be recycled, thereby reducing power consumption without sacrificing performance. The High-Temperature (HT) models can provide outlet temperatures as high as 900°C. The Clean Heater (DF-C) model's design minimizes particle emission and is exclusively manufactured using nontoxic materials. It meets the stringent requirements for clean environments in industries such as food and beverage, pharmaceutical, cosmetics, and electronics manufacturing. The LE Air Heater is available in Canada only through STANMECH and its distributor network. Tools bought through us are electrically certified for use in Canada. In many cases this entails replacing cords or switches in the tool to meet stringent CSA standards. Each tool is physically inspected by an approved field inspector prior to certification. We service everything we sell from our facility in Burlington, Ontario, Canada.